Rehab Or Die: Just how combustable is foam anyway? Ok, so after some web surfing it seems I'm not as insane as DH thought I was. Either that, or I'm in good company. 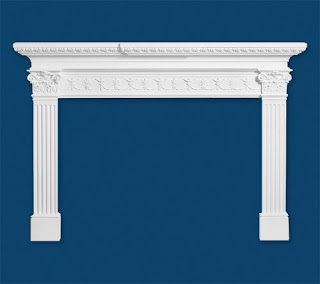 I found this example of a foam fireplace insert online, along with an entire field of architectural foam products. Expensive, but very very cool. This little guy here was selling for $630. A little over budget if you ask me. A few links I've found woith some very cool aspects are www.foamsupply.com and www.foamdesigncenter.com for starters, but there are myriad others. Oh yes, how godawful that was. The fake brick trim, the crappy wood moulding stapled to the wall. Gives me the ugh-shivers just thinking about it. That and the carpeting. ew. 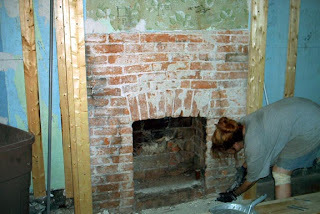 The the accidental discovery of the brick arch under forty pounds of plaster is what started this all off. Who knows what we'd have there now if it weren't for my overzealous demolition. I *thought* and I use that word cautiously now, considering the mess I'm in now.... that I wanted a fireplace similar to the one designed below. Just a simple two-column sides with a horizontal cap piece across the top. Unfortunately, I've been seeing these go for about $300 on the low end to over $2000 locally for wood mantles, and frankly, they just wouldn't fit right. I think these above were for sale for $100 each. Instead, we bought two nine foot high flat foam columns, cut them in half to fit in the car, and added a six window sill foam trim for the horizontal piece. Here are the leftovers from the cuts made to fit the height under the sill. We had to cut a middle section out of each of the pieces. The column pieces are on the left, the sill is to the right, and the bottom footer was waaay too tall, so I cut off a good 5" off of the bottom and scribed the base to fit around the uneven brick and wood flooring it was to sit on. We realized very quickly that the sill was not level. They are built for exterior trim, and hence slope outwards to drain rainwater off. We'd have to shim up the final cap piece and cover the gap with trim. I was going to need to attach a 5' long board across the top of the fireplace to attach the foam sill to. I also cut out 2 smaller blocks with the profile of the sill for each end of the sill to extend back to the wall. I just took the middle piece of sill I'd cut out from the middle and drew the outline on a piece of paper, cut it out and laid it over a 2x6, drew the outline and cut. There's a picture down here somewhere. We decided on leaving a 1/2" of drywall to the left and right of the foam columns to give the impression of more depth, but there was a bigger problem that needed addressing first. The inside gap to the brick face from the foam was over 3", and the foam column extended in past the drywall by an easy 6". We'd need to build a brace for the inside of the columns. I plumbed up the columns and attached them with a few screws to the drywall behind, then marked a line on the brick where the foam would need support. I thencut eight 4" pieces of scrap 2x4 and drilled holes in the center of each. Then I placed the 2x4 blocks on the brick, next to a 2x6 on it's side which was edged up to the line I'd drawn. This was the line I couldn't cross, or it would muck up the trim that I'd need to use to cover all this mess up. I then found the center of a brick and drilled a hole through the pre-drilled block. Once the holes were drilled, I put construction adhesive on the backside of the pre-drilled block and tapconned it to the brick face. I did this four times on each side; one each at the top and bottom, one midway up the base, and one very specifically where the two cut pieces of the column would meet in the middle, near the top. Once these eight blocks were in place, I measured the gap at each location, cut a 2x6 to fit the gap and nailgunned the supporting 2x6 pieces to the attached 2x4 blocks to make an 'L-bracket' behind the columns. OK, these foam things are not meant to be cut apart and reassembled. They are not even, not exacting, and not even close to matching up. There was some serious sanding needed to get the top and bottom pieces to match up. But once the screw holes were filled, and the connecting gaps filled and sanded, as well as matching up the side of the sill with the wood cut outs behind, then I needed to cap it off with a piece of poplar. After routing out a decorative trim on three of the sides of the poplar cap, it was time to shim it out to level to accommodate for the slope from the sill. We nailed the 1x6 poplar board down in the back (closest to the wall) to the 2x6 horizontal board I attached the sill to. Then we levelled out the cap and put shims in. Once all the shims were in place, we marked them, pulled them out, wrapped them in tape, and cut them back on the table saw. I didn't want to take any chances of snapping them off in place, or accidentally cutting the foam with a blade. Then we pushed a lot of the construction adhesive into the gap, replaced the shim bundles into their places, and brad nailed the cap down into the shims. The I found a spare piece of quarter round trim lying around and cut it to fit and brad nailed that in too. Oh, and a quick word on bondo that sets up faster than you can spread it smoothly: *&$%#@!$!. Oh, and just in case the brad nails didn't hold down the cap through the shims into the foam, we put books on top until the glue dries. If not, check it out anyway. She's got a free giveaway link this week. I'm starting to think there's nothing you guys can't do! This is the first I've heard of the foam fireplace inserts. Why on earth are they so expensive? If we were smart, we'd all go into the foam business, apparently. I can't beleive you discovered that under the fireplace that was there! We have one totally plastered over and we're not quite ready to dig it out... yikes! Your fireplace surround is charming; lovely job you did! It reminds me a lot of the one in our 1832 house. I enjoy seeing what you are doing in your row house. We have lived in several row houses -- in Pittsburgh and NYC. Fabulous homes. How wide is your house? One of ours in Pittsburgh was only 12-feet wide! We never got to actually live in it, had to move back to NY and sold it. I'm exhausted. I would have given up with "the old one looks just fine." The brick underneath is inspiring though. Super job. What a find with the brick underneath. My next door neighbor labored long and hard to build a brick fireplace and mantle and you found one covered up! Thanks for the great photos and step-by-step on what you did. Gave me some good advice. Nice job guys! How lucky you are to have found that brick arch. That is really beautiful. So many times we do our demo only to find some schmuck poured concrete down the chimney, or something else that is a major problem. You got really lucky there, and I really like what you did with the mantle, especially the height. This is insane. I get overwhelmed thinking about hanging my art. Which is why it's...never been hun. We find it's easier to make stuff and build stuff than it is to decorate. Which is why we have 90% of our art leaning up on our 3rd floor. You gotta get your head in the right place to hang art, and ours is not there. When you do hang, make sure you have some good company with decent taste and a bottle or two of good red wine.